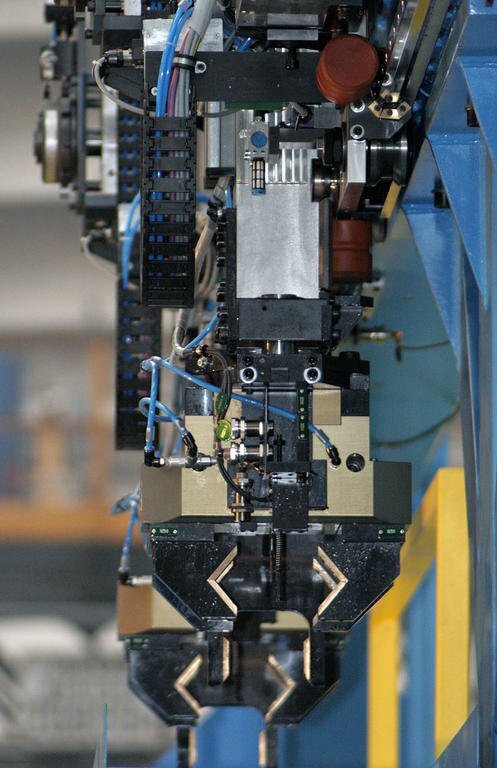 The infeed gantry is mostly used for insertion of workpieces into machine tools. It consists of pedestal, horizontal axis, traversing carriage, vertical axis and clamping head. The pedestal is made of thick-walled steel profiles and can be manufactured with two or three legs. The three legs are suitable, if a great stability is required, or for a reason of an insufficient space, e.g. to keep the access to machine free or to retain the possibility of machine cover removal. The horizontal axis consists of reinforced thick-walled steel profile, which has milled slots for linear guides in welded reinforcing rails. 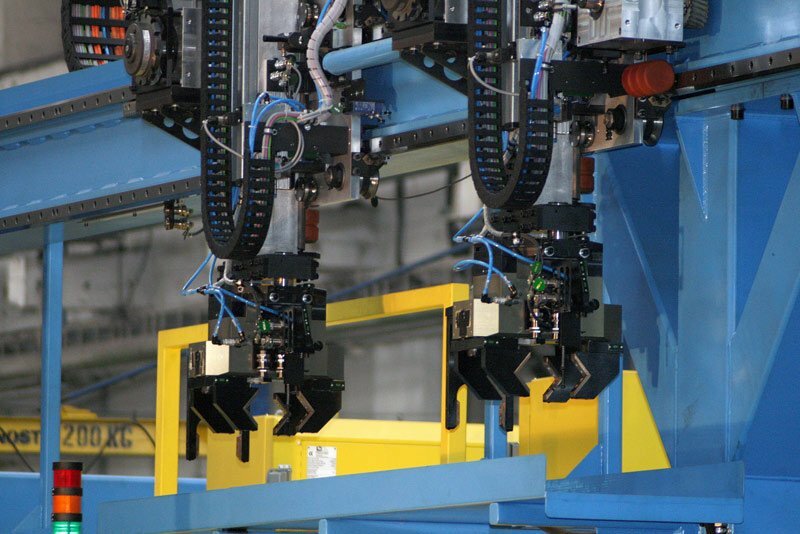 The traversing carriage rollers are guided by guide rails. Possible movement of traversing carriage is limited by means of fixed stops at the horizontal axis. 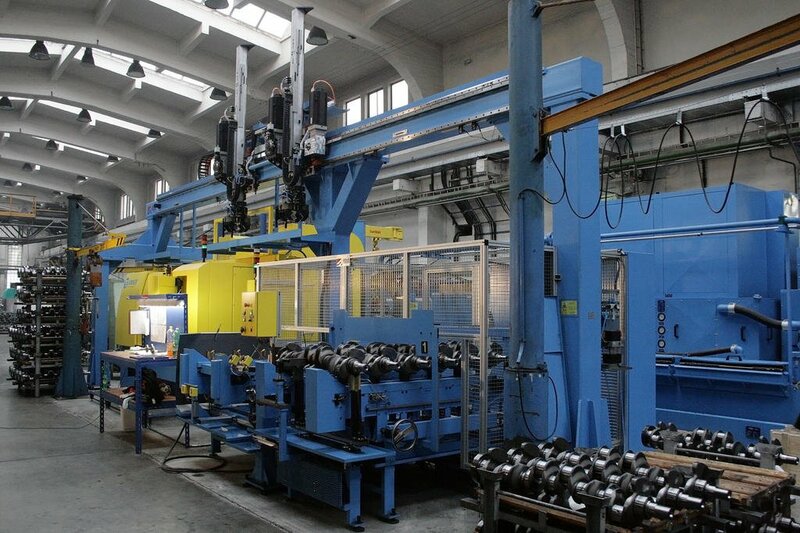 The traversing carriage, on which most of action elements of the equipment is located, is the group that serves for infeed gantry movement in horizontal and vertical directions. Three geared servomotors are intended for positioning of all three axes; the set of limit switches controls motions of function members as well as other mechanical groups, i.e. lubrication group or locking element preventing the fall of vertical axis that serves for partial functions, which are necessary for equipment operation. 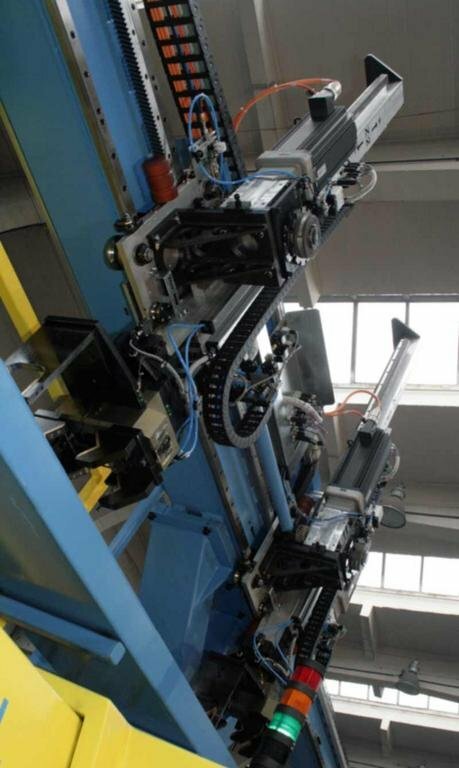 The pre-tension of rollers for horizontal and vertical axes determines, together with robustness of load-bearing parts of infeed gantry, the overall infeed gantry rigidity and, thereby, also the infeed accuracy of an infeed gantry. 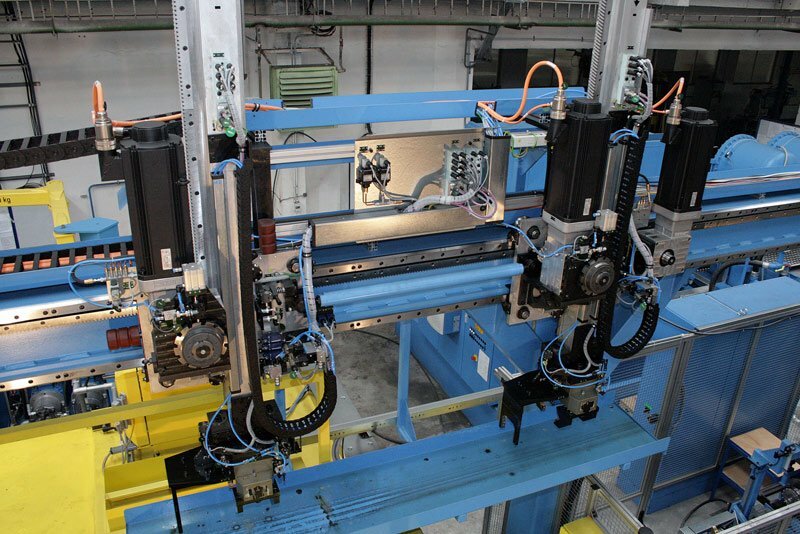 The selection of vertical axis drive by means of either a toothed belt or rack is done based on operational travel of vertical axes, infeed accuracy requirements and requirements on dynamic parameters of all equipment as well. An aluminium profile with milled slots for guiding as well as linear guides with rolls is the most important part of the vertical axis. Their rigidity is high enough to ensure the infeed accuracy together with the resistance to possible failures. The infeed gantry is designed in accordance with the safety regulations and environment protection regulations as well.